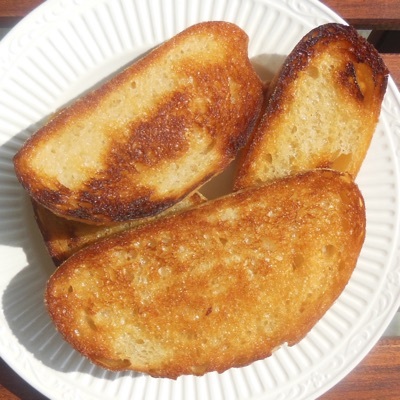 Toasting on the pan is quicker but baked comes out better. Cut bread into 1/2 inch slices. Cover each side of each slice with oil or butter to taste. If you aren't sure, start with 1/2 TSP. Bake for 5 minutes, then flip and bake for another 3 minutes until golden and crunchy.